What are the main differences in signs and symptoms, between the kidney and lower back pain? Kidney pain is classified as either minor or severe. Kidney stones, can sometimes cause nausea and vomiting due to the severity of the pain To buttock, back of the thigh, calf, foot, pins and needles and numbness of toes on one side. What’s the best treatment for Kidney Pain and Lower back pain? 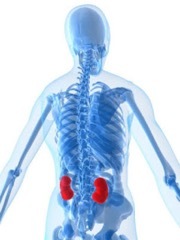 Kidney pain treatment occurs once the source for its occurrence has been located by your GP. Kidney stones will be aided with the use of pain medication along with increased amounts of water ingestion to accelerate the kidney stone. Surgery may be required in cases of particularly large kidney stones. In cases of infection, antibiotics are used to help remove the bacterial infection. Lower back pain treatment differs significantly from kidney pain treatment, due to the many different causes. Pain in the back is treated using pain relieving medications along with physiotherapy. These can include manual therapy such as mobilisation, manipulation and massage, exercises to stretch and strengthen, acupuncture and Pilates. If after conservative physiotherapy treatment, pain levels and returning back to normal movement doesn’t improve significantly after a course of 6-8 weeks, then referral back to your GP to request further investigation by a spinal specialist maybe indicated.